Trouble on the Mountain is the second of a series of three books for Middle Grade readers set in 1933, 1934-35, and 1936-37 based on the author's solid historical research, familiarity with the region, and imagined young protagonist. The specific corpsmen who become his friends are also imaginary but their tasks, travails, and stories are actual details and anecdotes from Ascutney and other CCC camps. There's trouble on Ascutney Mountain --and beyond--for Will Ryan and his friends at Camp 129 of the Civilian Conservation Corps. Just as 13-year-old Will hopes to settle into a new life with his new family, his hard-won happiness is threatened. A dangerous wildfire, an unexpected blizzard, secrets from his past, and that new girl at school are challenges facing Will. Even the future of Camp 129 suddenly seems uncertain. Set in 1930s Vermont, Trouble on the Mountain is the story of a boy learning to find his way in tough times. The narrative is followed by: a short essay on the Civilian Conservation Corps; fourteen historical photos provided by the national CCC Legacy organization; and eight Topics and Questions for Discussion focused on issues in the book. 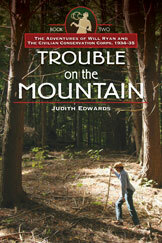 Judith Edwards lives in southeastern Vermont near Mount Ascutney State Park - one of many parks nationwide whose roads, stone buildings, and campsites were created by CCC corpsmen in the 1930s. 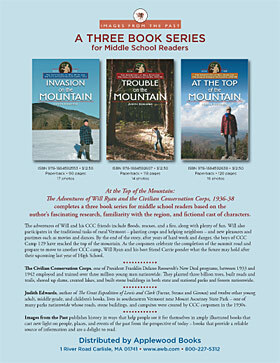 In addition to Invasion on the Mountain, Book I in this series, she is the author of the acclaimed book, The Great Expedition of Lewis and Clark (Farrar, Straus and Giroux) and ten other young adult, middle grade, and children's books: Colter's Run; The Lindbergh Baby Kidnapping; Nat Turner's Rebellion; Jamestown, John Smith and Pocahontas; The Plymouth Colony and The Pilgrim Adventure; Henry Hudson and his Voyages of Discovery; Lenin and the Russian Revolution; Abolitionists and Slave Resistance; The History of the American Indians and the Reservation; and Bending Moments: Crossing the Uncomfort Zone To Change. Judith Edwards presents school, library, and public programs around the issues in her books. 118 pages 6" x 9"